If you’re changing address in or around Sydney, Smart Move’s first-class home removalist services will help you make the transition with minimum fuss and maximum efficiency. We specialise in tailoring your move to your specific expectations. From start to finish, we’ll provide everything you need, including realistic estimates, boxes and other essential packing material and the right sized truck and number of staff for the job. Smart Move’s expert removalist services and years of experience will take the worry of moving out of your hands. We offer boxes and all the other packing material you will require as an option, and you don’t pay for what you don’t use. We have all the right tools to disconnect your plumbed appliances and set them up again in your new home. Our truck that arrives on your doorstep will be exactly the right size for your move (based on the information given to us). We have the expertise to take apart and put back together all your self-assembly furniture. Our uniformed professional removalists will ensure your move is efficient and effortless. We tailor our quality service to your needs and time restraints. We are upfront about our charges. We offer a capped and hourly rate for 4-bedroom houses and hourly rates with no minimums and running by the 15 minutes for smaller moves to match your budget. One of our areas of expertise at Smart Move is effective, efficient office removals that won’t put a dent in your company’s budget. Nor will it cause any major disruption in your daily flow of business. At Smart Move we understand that office relocation can be a stressful business. That’s why we make it a priority to ensure that your move is completed quickly, quietly and with minimum disruption to your working week. Our trained movers are experienced with commercial relocation and know exactly how important it is that your removals happen without hampering your company’s productivity. No matter if you’re a small office or a large enterprise, leave it to us, Sydney’s #1 office relocation expert, to help you plan and streamline your move from your old business address to your new location. Choose the office movers who care about your business as much as you do. 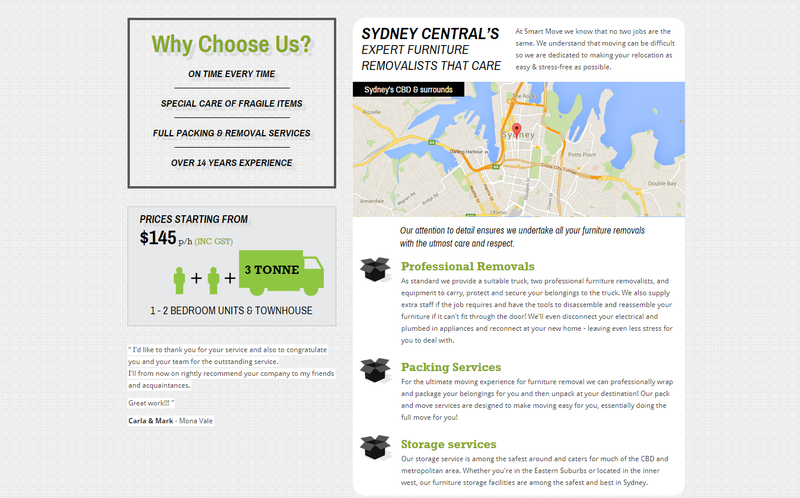 For all your office relocation requirements throughout Sydney, your move is in capable hands. Smart Move is the removalist company you can trust. By choosing Smart Move you’re choosing to relocate ease. 1300 6683 87 (1300 MOVE US) or request a quote online by filling out the form on the right today! We know that you’re busy & time poor & we understand that packing your home is a stressful job & time consuming. We can help you pack & unpack by sending in our women packers prior to the move to make the task easier. We promise that our branded truck and uniformed, friendly removalists will arrive on time on the day of your move and provide a great service that won’t disappoint you. We also supply quality boxes & other packing materials to help make packing a breeze. When you purchase or hire our boxes & materials we’ll deliver them to your door. After your move we’ll buy the boxes back & collect them.